Daily Camera end story commenting – but comment are open here! Online bullies and old white retired men everywhere are a little pissed off today as they’ll have to look elsewhere to post their comment about the Boulder City Council or the infamous rightsizing project, a global scandal that will go down in history books as one of man’s biggest blunders. I too am a little sad. 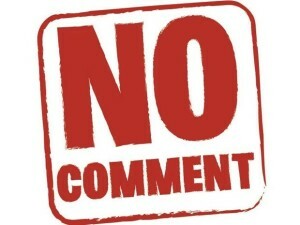 Continue reading Daily Camera end story commenting – but comment are open here! Spotted this pickup truck south of Leipzig. First time I’ve seen a Sangyong branded car. On further research I discovered that this is not a Chinese brand but a budget South Korean automaker. We all know that as of 2016 the Chinese don’t have the means or perhaps desire to build a car that will pass modern safety crash tests so I’m glad I was wrong. But strangely Germany has some lax safety standards such as allowing quads to drive on the roads and allowing the use of crappy micro cars powered by lawnmower engines on the public roads too! Seems like Sangyong had a deal with Mercedes Benz to license some of their old models. On the wikipedia page for the models they produced one can see a bizarre array of old Benz models morphed into newer looking ones. 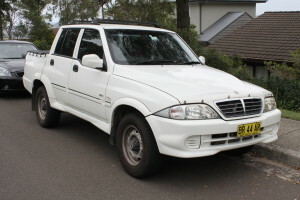 The white pickup truck with what seems like a Merc front grill is one such example. 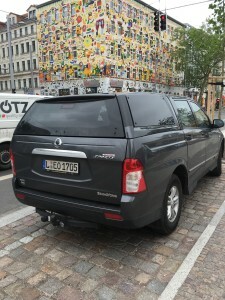 What in gods name is that …..
Chinese cars in Germany – what next…. ?